Jersey City swears in 13 new fire fighters. Thirteen is not an unlucky number, at least not for residents of Jersey City when it comes to bolstering the ranks of the Fire Department. 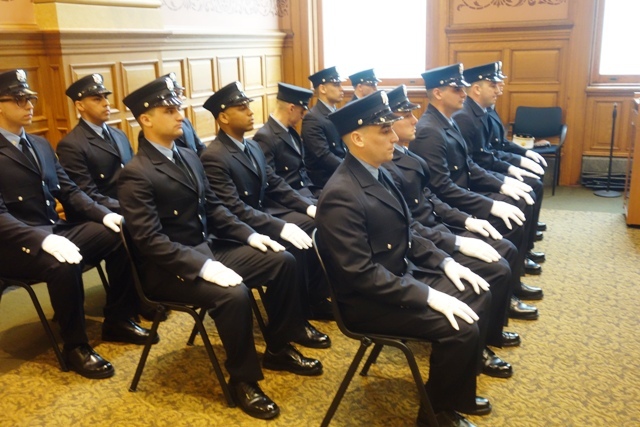 Thirteen recruits were sworn in as probationary firefighters at a ceremony in City Hall on March 8. 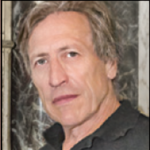 “I want to say publicly a special thank you to the council that’s behind me. In the last five years, they’ve been second to none in investing in the fire department,” said Mayor Steven Fulop. After months of extensive training, the recruits seemed more nervous about the ceremony than they might be responding to a fire. Dressed in formal uniforms and wearing white gloves, they joked nervously prior to an event that would launch them into a career as firefighters. The 13 recruits were selected from 100 applicants, 29 of whom went to the academy before being narrowed down to the current group, said Acting Fire Department Chief Joseph Menendez. The thirteen new recruits are Dana Granteed, Taylor Hausmann, Christopher Modungo, Joseph Early, Kevin Mongiello, Kurt Warner, Eric Nunez, Albert Bauer, Robert Perry, Thomas Dolaghan, Bray French, Harold Pineda and Marshall O’Keefe. Their assignments brings up the total number of fire fighters to 599. In the hour prior to the swearing in, the recruits practiced how to sit or stand during the ceremony and what to do when called up to receive their badges. This is a ritual so drenched in tradition even seasoned firefighters remember when they went through it. This is the third class sworn in since Steve McGill became chief of the fire department two years ago, although Menendez oversaw this ceremony. Entering to the sound of the bagpipes, the recruits were greeted by the applause of family and friends who filled the council chamber to wish them well. “Those who are fans of the department really turn out,” said Councilman Daniel Rivera. In address the assembly, Mayor Fulop made a point of thanking the families as well as the firefighters, saying that although the firefighters are the ones who go out and fight fires they often have to miss important events in their personal lives. So the families of firefighters make sacrifices in supporting their husbands and wives. Since 2013, over 200 firefighters have been hired under Mayor Fulop. These recruits will be assigned to their firehouses after they have undergone an additional five months of training. This includes three-month EMT certification course.